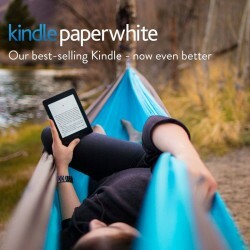 Kindle Paperwhite has an improved high-resolution 300 ppi display for crisp, print-quality text. Kindle Paperwhite introduces our most readable font, Bookerly. Designed from the ground up, Bookerly offers a lighter, more graceful look, much closer to traditional print than to computer displays for enhanced readability, particularly for long-form reading. With improved character spacing and the addition of hyphenation, justification, kerning, ligatures and drop-cap support, Kindle’s best-in-class typography allows you to read more easily and quickly with fewer page turns. Unlike reflective tablet and smartphone screens, the latest Kindle Paperwhite reads like paper – no annoying glare, even in bright sunlight. Kindle Paperwhite guides light towards the surface of the display with its built-in front light – so you can read comfortably without straining your eyes. Adjust your screen's brightness for great reading in any light. Kindle Paperwhite won't leave you tethered to a socket. A single charge can last up to six weeks (based on half an hour of reading per day with wireless off and the light setting at ten). Thinner than a pencil, lighter than a paperback. Hold Kindle Paperwhite comfortably in one hand for long reading sessions. Kindle Paperwhite is purposely designed as a dedicated E-reader. Indulge your love of reading without interruptions such as e-mail alerts or push notifications.